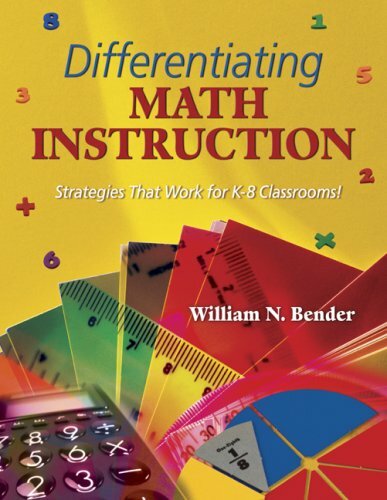 Differentiating Math Instruction Strategies That Work for K-8 Classrooms! instruction to raise student achievement in their classrooms. New and seasoned educators alike will be quick to put the following key features to use in their classrooms: "Ideas From Teachers" sections that highlight actual examples of the differentiation process in action At-a-glance lists of "Top Ten Tactics" for successful implementation in K-8 classrooms "Web Site Reviews" that outline additional online resources for effective mathematics instruction Concrete strategies to tap multiple intelligences Research on the value of brain-compatible teaching is combined with teacher-generated tips, including creative ways to get students visualizing, vocalizing, and moving during math-to make instruction more meaningful, motivational, and successful. audiences across the nation of innovative, up to date information, based on current applied research. Dr. Bender received his Ph.D. in Special Education from the University of North Carolina and currently consults with schools and districts in the United States and Canada.